From time to time, readers write and ask me about Italian textiles from various Italian cities that I have not previously mentioned. Either they have some family ancestors who come from these cities or they are planning a visit and want to know what they can see. For those who asked and also for the possible benefit of others, I would like to draw your attention this spring to Genoa. There seems to be a series of lectures and exhibitions with a textile theme than makes me sorry that I won't be able to see any of it. Here you'll find a listing of the different events and the museums which will host them, it seems a terrific display of Textile History in Genoa. The City of Genoa, which has been a centre of activities connected to silk processing for centuries, houses two important public collection of textiles: the Collezione Tessile della Soprintendenza, on display since 1999 in two rooms at the Galleria Nazionale di Palazzo Spinola, and the Collezioni Tessili dei Musei Civici, which are located at Palazzo Bianco. Both comprise an heritage of a high artistic and historical level. The import of the textile heritage of the two collections called for the founding of the DVJ Damasco Velluto Jeans - Centro studi tessuto e moda, housed in Palazzo Bianco, which will also make use of the exhibition rooms of the Galleria Nazionale di Palazzo Spinola. They have a FaceBook page as well. If you get to see any of this, please leave a comment or write and let me know! As a New Year's gift, the Association "I Merletti di Antonilla Cantelli" of Bologna has made an Aemilia Ars needle lace instruction booklet available for free download on their website. This is such a treat! Both beginners and those of you with previous needle lace experience will be delighted to find that the location of support stitches and the order of working are clearly indicated. While the text is in Italian only, the diagrams and photos are clear - you can always use Google Translator if you need to. 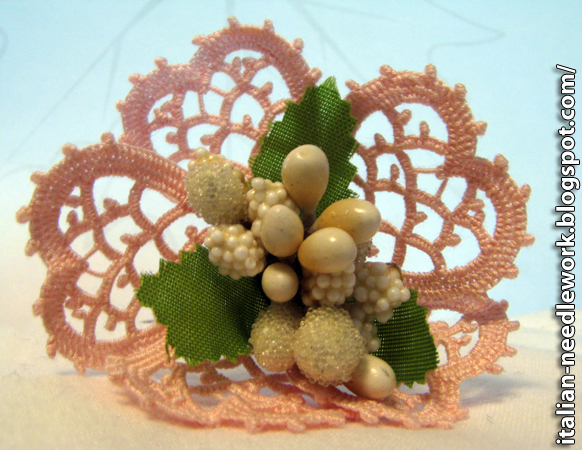 The freebie is an exquisite flower proposed in DMC tatting thread no. 80 which opens up your options for coloured thread. You will no doubt become very skilled at executing the picots by the time you're done, there are definitely a lot of them! On the last page of the freebie Aemilia Ars instruction booklet you will find a photo of the finished project which is followed by another photo which serves as inspiration for doing different flowers. That last photo was taken by myself and is used with my permission. Some of you might recognize it from the post I wrote about the Association's book on Aemilia Ars borders (available for purchase from Lacis in the US). That particular flower (photo above) was given to me as a gift by the Association "I Merletti di Antonilla Cantelli" when I was in Italy in 2011. I am delighted that they could use my photo so others could appreciate their work and perhaps use it as a source of inspiration for their own creations of Aemilia Ars needle lace. 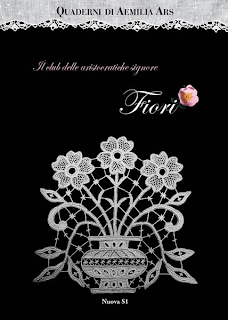 If you're interested, the Association "I Merletti di Antonilla Cantelli" also published a book on Aemilia Ars flowers, the book is called Fiori and is available in the US from Lacis. Way back in April of 2012, Carmen wrote to tell me about Brona who had posted a tutorial on her blog for Puncetto needle lace. Now when you send me emails, I always save them in my in-basket until I can answer them or investigate the information that you send. However, often I am unable to do it right away. Please don't think I have brushed you off or ignored you - unfortunately my blog is my hobby, not my career and it gets the very last of any free time I have which means that sometimes it takes months for me to investigate information I receive. Brona has done an outstanding tutorial on Puncetto needle lace in a series of seven posts which she has gathered together in one page on her blog. Her diagrams are clear and easy to understand and there is a google translator button at the top right of the homepage to help you decipher what she has written as Brona's blog is written in Czech. She has covered the basics and then tackled the more difficult motifs and even given tips on using more than one colour of thread! I enjoyed Brona's Reticello project in the May/June 2012 issue of Piecework magazine and hope that she will treat us to a Puncetto needle lace project in the future!